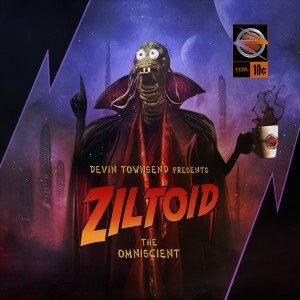 Ziltoid the Omniscient is an album that was created, written, produced, recorded, engineered, programmed and mixed almost entirely by Devin Townsend alone. Mastered by Ue Nastasi, additional support was also given by Dave and Mike Young (additional engineering), Fredrik Thordenal (Drums) and The Beav and Dave (additional dialogue). The paragraph below provides an outline of the concept so if you want to avoid any spoilers skip ahead. Ziltoid travels to Earth in search of the universes ultimate cup of coffee (as explained in ZTO). Dissatisfied with the brew offered, he goes to war with Earth and sets out to capture the fleeing humans as they leave Earth in search of a way to stop him. Further into the adventure, Ziltoid encounters the Omnidimensional Creator who reveals the truth about his existence that leads to an unexpected conclusion. A more detailed synopsis can be found by reading through the lyrics and supporting text in the albums booklet. Townsend showcases his vocal talents through a range of spoken word voices, varying degrees of aggressive singing and shouting mixed with higher pitched and cleanly sung verses. Instrumentally, keyboards are more prominent during the softer moments but they do have some interplay with the metal parts of the songs although they can quickly lose out to the relentless mechanical drumming and synchronised guitar riffs. Songs like By Your Command and Ziltoidia Attaxx, (which is one of the two songs to feature guitar solos, the other being N9) exemplify this style. Solar Winds takes a different approach, featuring dramatic keyboard work and soft guitar playing while departing from the percussion entirely for a brief time. Eventually it builds up into a hard rock song before shifting into the hammering metal style again over a 10 minute period. Color Your World has a flawless transition between the metal and soft progressive rock parts that will make you question whether it’s even the same song until a raspy voice slowly roars “Ziltoid… the Omniscient” out of nowhere. Planet Smasher briefly gives the bass time to breathe by plodding alongside the guitar to create a sense of foreboding as it trudges on ominously. Townsend takes this opportunity to show off how deep and guttural he can make his voice, while making it fit the tempo of the song aptly. Hyperdrive is probably one of the biggest standout songs on the album because the music has a strong ethereal quality and a repetitive guitar hook that will stay in your head long after the album is over. Townsend’s voice follow suit as he sings in a soft and distant way for most of the song. N9 begins with an intense barrage of drum patterns and the keyboard jumps to the forefront and calls out with a sense of urgency, waking up the listener just in case you were getting too comfortable listening to Hyperdrive. The vocals are delivered in the same way as they are in Hyperdrive, which would makes it a good introductory song to metal for someone who isn’t fond of the harsher singing style but is interested in what can be offered musically. Two short interlude-type tracks are present on the album. The mid album Omnidimensional Creator is a dialogue between Ziltoid and the Omnidimensional Creator that disappears as fast as it arrives. The second is the albums closer, Tall Latte, which prevents it from finishing with the bang you’d expect, but it is necessary to finish the story. Other parts of the plot can be missed quite easily as the instruments are made the focal point in the mix and not always the vocals. It’s also worth noting that some of the lyrics are not directly related to the story and could contribute to this problem. All in all, Ziltoid the Omniscient is a highly entertaining and unique sounding album that doesn’t neatly fit into a subgenre. It could easily speak for itself based on the musical merits alone but the accompanying story, despite the narrative flaws, is joined with a great sense of humour (something that the metal realm often lacks) and a creative style of song writing that makes it an exciting and memorable listening experience. The special edition CD has three tracks, the latter two of which do not relate to the Ziltoid concept. 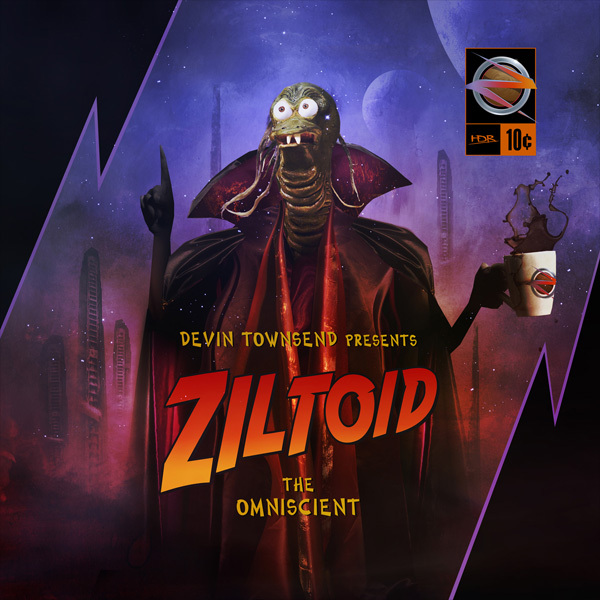 The first track does and opens with Ziltoid stating “you will hear some terrible, terrible bonus material but you know it’s Ziltoid so it’s fun” and manages to live up to both parts of the statement and the title, with Ziltoid going on a long, unfiltered tangent spanning several subjects in Don’t Know Why. Travelling Salesman is an upbeat song with a strong rhythm section and overly loud, punchy drums and slurred lyrics. Another Road features a fuzzed out electric guitar with some lively solos and a metronome ticking away over the top of everything for no discernible reason. Townsend’s voice is placed right at the back of it all for the duration of the song. In summary, the material has some novelty value to it and is worth a listen or two, but it isn’t the kind of thing that you will keep coming back to.